This 126-foot mothership will be home for the crew of Offshore Adventures for about five years. Like squid drawn to a spreader light, angling aficionado and outdoor-sports TV-show producer and host Chris Fischer had to see what was swimming under the large, brightly lit, commercial-style boat sitting in the harbor at Costa Rica&apos;s Los Sueos Marina. Even though he had just finished a full workday with his own crew for their ESPN2 show Offshore Adventures, Fischer thought there might be a good night bite under those lights. He wasn&apos;t wrong. After launching the RIB and taking a short hop to work his line under the lit-up vessel, the fisherman bagged his largest corvina to date. But something caught him, too—an angling epiphany. He noticed that he was fishing under the 126-foot converted crab boat Arctic Eagle, which was serving as mothership for a 45-foot Cabo Yachts sportfisherman. In that moment the mission was clear: Find a way to get a mothership like this and take his crew on a be-all and end-all adventure. 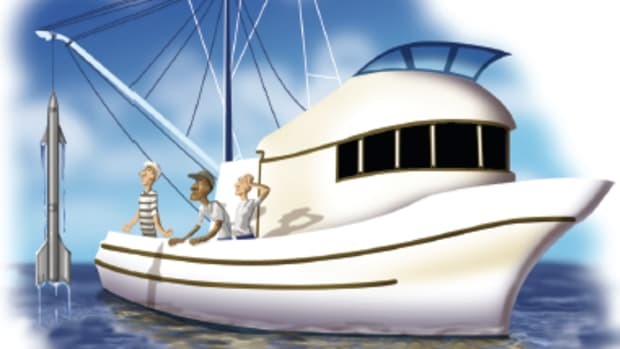 As he sat in the tender, bobbing in the glow of the giant blue-hulled vessel, he didn&apos;t know that opportunity was about to knock on his door, turning wishful thinking into reality. Fischer arrived back at the marina to learn that the owner of the converted crabber, Frank Miles, was on shore, and word had it that he was looking to sell both the mothership and the Cabo 45 on her deck. Ocean&apos;s Capt. Brett McBride (left) and owner/TV host Chris Fischer (right) go over their charts. Fischer met Miles at the resort that evening, and the next morning he toured Arctic Eagle. By the end of the day, Fischer bought the whole shebang on a handshake. That was about a year ago, and now the crew is preparing for a five-year, around-the-world trip that will take them to such far-flung waypoints as Vanuatu, Tonga, New Caledonia, French Polynesia, and the Marquesas. 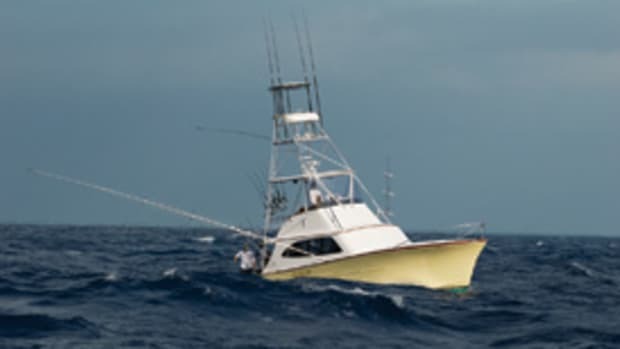 But this voyage will be about more than just people catching cool fish with weird names, cooking segments for the TV show, and dropping back on billfish, all in the name of pure entertainment. Fischer says he knew that taking a journey like this for the sake of simply catching new and bigger fish was "too shallow." He saw an opportunity to use this vessel—which was renamed Ocean by Fischer&apos;s three-year-old daughter Sarah—and the trip to participate in both education and research in the name of preserving the world&apos;s oceans. 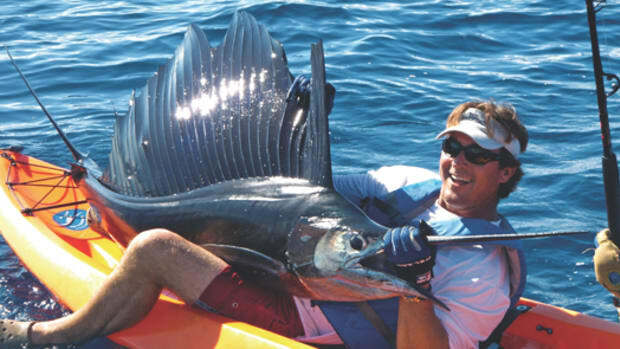 With the help of The Billfish Foundation, a nonprofit conservation organization that counts Fischer among its board members, he developed a curriculum for grade-school children. Prior to the arrival of the Offshore Adventures&apos; crew, students will be given study materials about the world&apos;s oceans. Fischer and his team will then come ashore and speak with the children about how they can be stewards of the sea where they live. 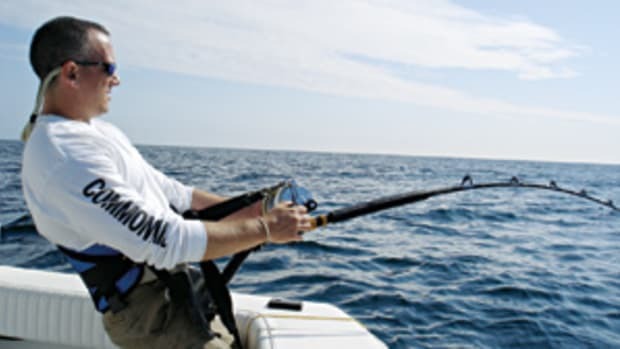 In addition, the crew will work with local fishermen to explain how commercial and recreational anglers can work together to protect their interests while still maintaining sustainable fish-stock levels. They&apos;ll also teach them how recreational sportfishing can make for a great tourist trade. 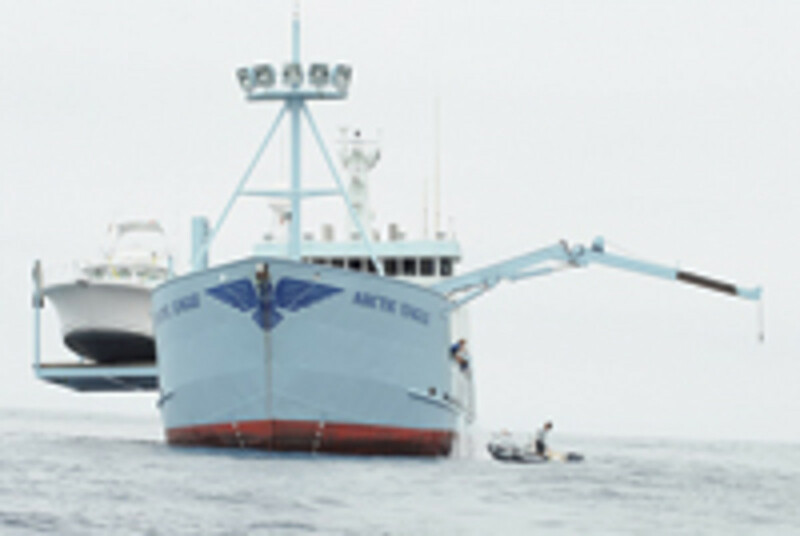 Ocean&apos;s massive lift was recently put to work while helping scientists tag great white sharks. 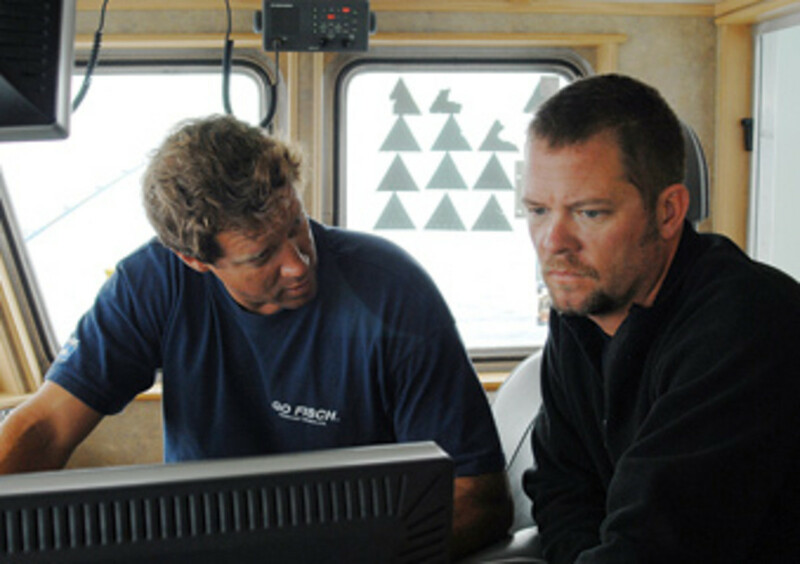 Another part of the plan is to come up with what Fischer calls "a state of the world&apos;s oceans" report based on what the crew sees and catches. "You talk to old timers, and they say it used to be wide open [fishing]," Fischer explains. "Well, what does that mean?" he asks quizzically. 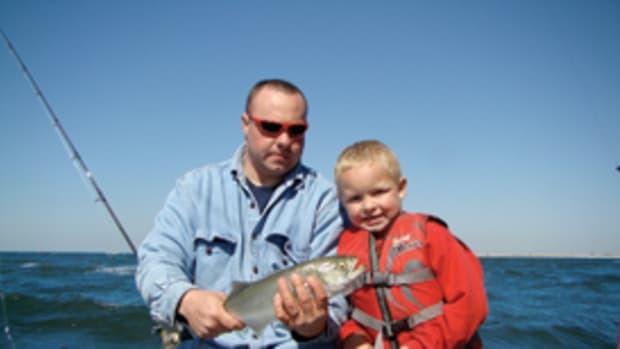 This angler intends to answer that question by documenting the status of fish stocks in specific places at specific times, and he&apos;ll share this data—what the crew sees and catches and how it catches it—with scientists and conservation groups. Fischer hopes this will help provide a baseline for the stocks in a particular region. "It&apos;s only for the fisheries we&apos;ll visit, but at least it&apos;s something [to work with]," he adds. Ocean&apos;s crew will also be taking along specialized equipment at the request of scientists to measure dissolved oxygen levels in certain bodies of water. This helps provide insight into the overall health of that region of the ocean and its inhabitants. 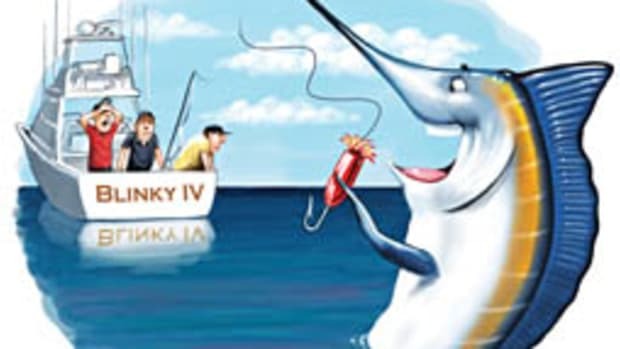 For instance, the Atlantic Ocean seems to have higher dissolved oxygen levels at deeper depths than the Pacific, so blue marlin in the Atlantic can dive much farther (to around 2,600 feet), keeping them safer from longlines and nets. Even before the expedition begins, Ocean is already working in the name of research. The boat&apos;s massive, 75,000-pound-capacity lift, which is used to launch the 45-foot Cabo (now called Go Fisch), recently helped researchers raise 1,000- and 1,500-pound great white sharks onto Ocean&apos;s deck. 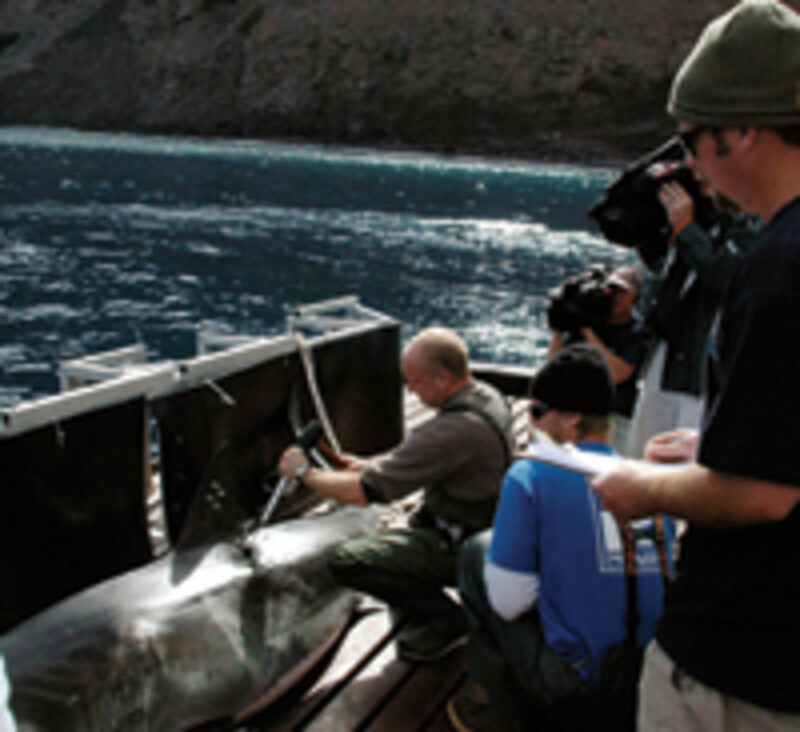 The scientists inserted GPS tags into the dorsal fins to get a handle on their travel habits. 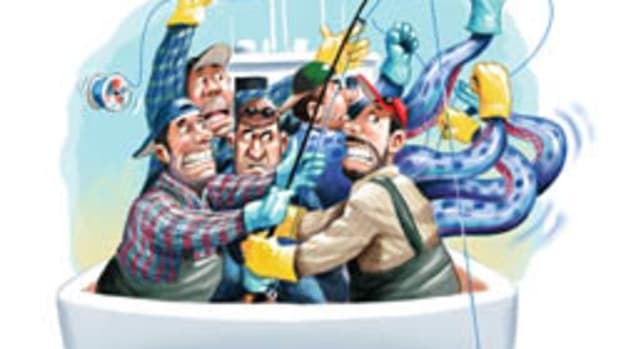 "We fished with giant hooks and chain," Fischer recalls excitedly. "We&apos;d hook up the fish, use chase buoys, and bring them onto the lift and into the boat for the tags," he adds, laughing a bit as he tells me, "It&apos;s just wild stuff!" You can tell Fischer is enjoying every minute of this dream that was born under the spreader lights of a crab boat. The best part is that there are 1,826 more days to go. Ocean and her crew will be arriving in Miami this month to kick off their world tour. Visit www.offshoreadventures.tv to learn more.